It was a 10-day, 1,900-mile motorcycle journey across seven western states from St. Joseph, Missouri, to Sacramento, California, and took place September 15-24, 2009. The Pony Express occupies a disproportionate part of the history of the American West. Cruel hours, terrible weather, life-threatening hostility in every direction, and poor prospects for retirement. Yet folks lined up to ride uncertainly through trackless and forbidding territory, to sleep on a hard, cold dirt pile and be awakened by the sound of gunfire. The H.O.G. touring rally retraced the historic route that the original Pony Express riders followed in 1860-61 as they moved mail through America’s Wild West. Points of interest included various museums tracing the history of the famous ride, and actual Pony Express Station facilities and monuments as well as the opportunity to stand on the original Pony Express trail in several locations. Ride activities included seven dealer-sponsored events along the route. Rally attendees covered territory that tested the endurance skills of Pony Express riders on horseback nearly 150 years ago. There were a number of special events to highlight on this ride. The first was at Flaming Gorge Harley-Davidson in Green River WY., where Willie G and his wife Nancy participated in a Friendship Dance with the Native American dancers from the Wind River Indian Reservation. There was also a 500–mile riding stint from Salt Lake City to Carson City, Nev., that was recognized with a unique “500-mile” pin commemorating that segment of the rally. In addition, all the riders and HOG general manager Benny Suggs along with Nevada Governor Jim Gibbons visited the Northwest Territorial Mint in Dayton, NV on September 23, 2009. They presented Suggs with a silver medallion along and approximately 500 HOG members also received a version of the national HOG challenge coin which featured the official Harley Owners Group logo on one side and the HOG shield on the other. 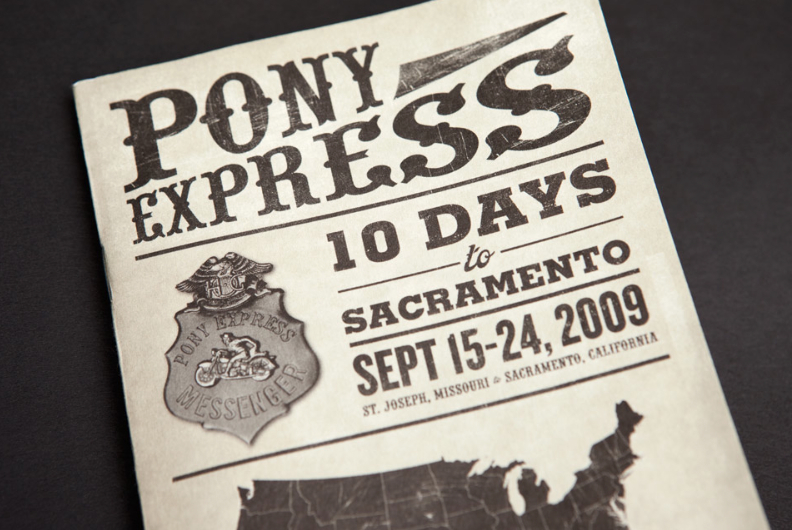 Each was uniquely edgemarked with the text, “Pony Express Ride 2009” for the event. No other HOG challenge coins have been edgemarked, making them prized Harley-Davidson collectibles. There are a number of ways to enjoy the Pony Express National Historic Trail these days, but not many can say they rode with Willie G on the Pony Express ride! It’s a song (HERE) by jazz fusion band Pat Metheny Group, Lyle Mays and rock singer David Bowie. The song is profound and meaningful – and absolutely perfect for today’s circumstances. But, I’ve gotten ahead of myself. I’m an avid HDTV watcher. The last few days I’ve spent time on the RETRO (RetroPlex) channel. Interestingly there’s been an increase of movies about disillusioned civilian contractors working in the U.S. Government on the line-up. Covert operations complete with code names, spy camera’s that even Bond would be envious. 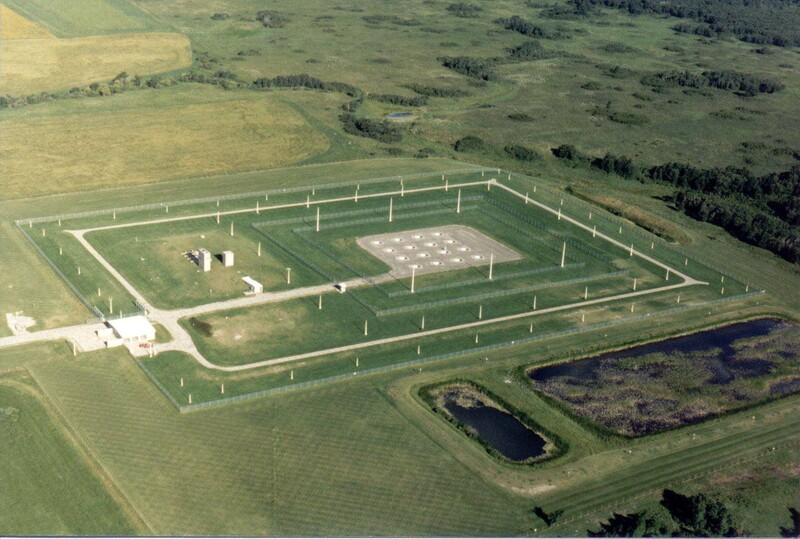 In the 1970’s it was called the “black vault” (classified communications center). Move forward 30+ years and it’s a data center called PRISM which serves as a communication facility to vacuum up information on millions of private citizens in contradiction to the 4th amendment. And while we’re on the topic, I was under the impression that the NSA hired Ph.D’s with military service, but now we learn that Edward Snowden, a low-level IT technician making $200K a year – only in America could a civilian contractor who didn’t graduate high school or complete college make $200K – used a banned USB thumb drive to smuggle documents. I just don’t understand the lack of outrage about his salary, but I’m off point. Mr. Snowden stated that he justified smuggling documents because the intelligence community had become the United Stasi of America – a reference of the surveillance powers over their own citizens that the East German Stasi – the secret police in the former Democratic Republic of East Germany. You might recall that back in 1979, journalist Robert Lindsey chronicled the true story of Andrew Daulton Lee and Christopher John Boyce. Two high school buddies from good families who were tried and convicted of espionage. Boyce’s FBI agent father landed the floundering 21-year-old a job at TRW who developed and manufactured satellites for the CIA. Boyce became disillusioned after learning about the CIA activity to remove Australia’s Prime Minister Gough Whitlam because he wanted to close U.S. military bases. With Lee’s help, Boyce set out to sell government secrets to the Soviets. In 1985, the book was turned into a film called The Falcon and the Snowman. As I watched the movie on RETRO, I was reminded of my employment at ITT/Federal Electric Corporation. 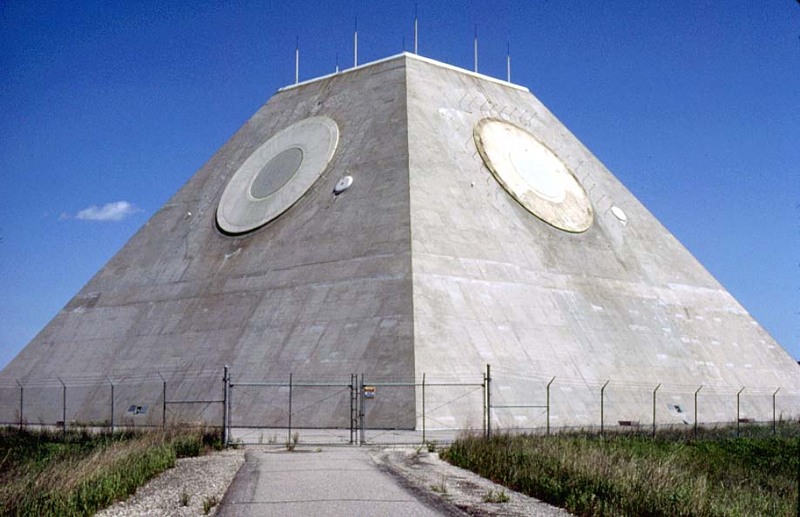 I worked at the Stanley R. Mickelsen Safeguard Complex (MSR) or as the locals called it, the “prairie pyramid.” It was the only operational ABM (Anti-ballistic Missile) defense system. 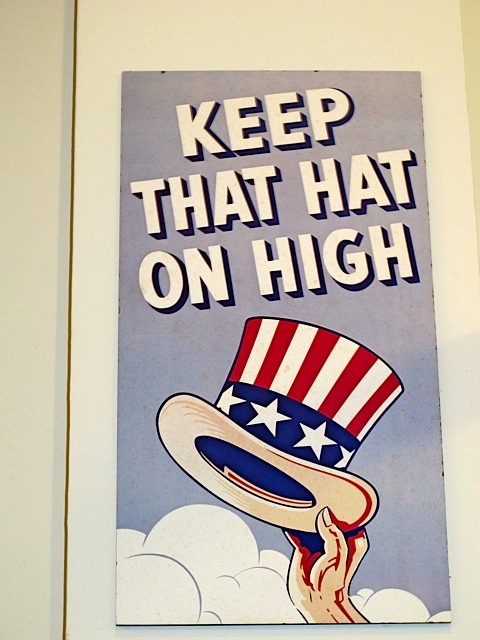 It’s mission was to defend the continental U.S. from a ballistic missile attack from the USSR or China. And similar to the movie, security requirements of any installation housing nuclear weapons are specific and extensive. There were 30 Spartans (long-range intercepts) and 70 Sprint (close-in intercepts) missiles on the complex. 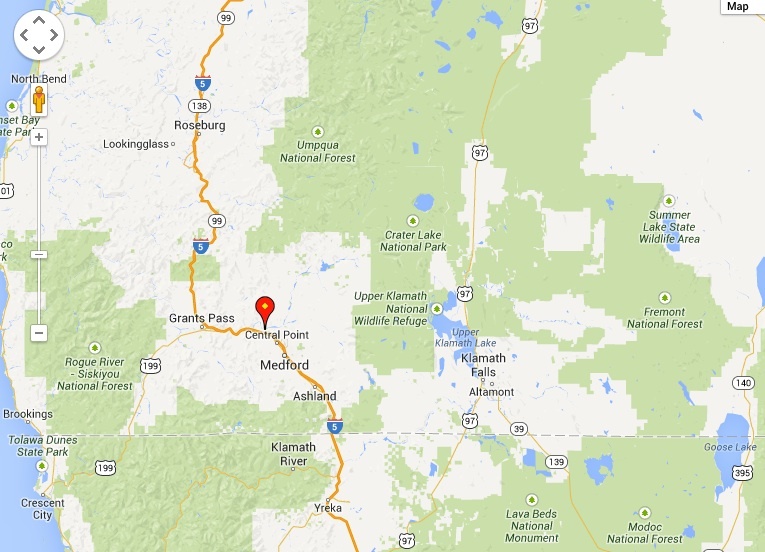 I initially worked at the MSR (Missile Site Radar) facility for about a year prior to receiving a restricted access clearance. 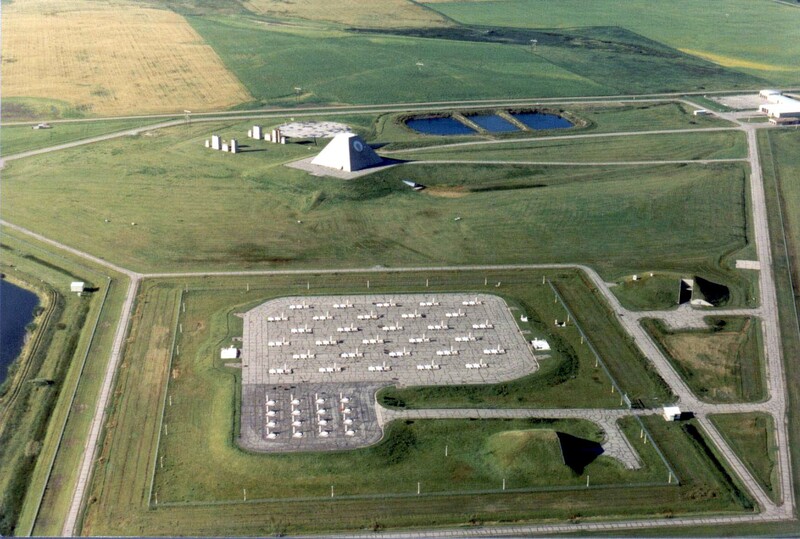 I was then moved to the RSL (Remote Site Launch) facilities which housed the close-in intercept missiles and on many occasions had access to “exclusion areas” (nuclear missile field) in the facility. The RSL’s were hardened against nuclear blast and were capable of operating autonomously while “buttoned up” during an attack. After all these years the Edward Snowden story speaks to me, both at a national level and from the mundane working world. 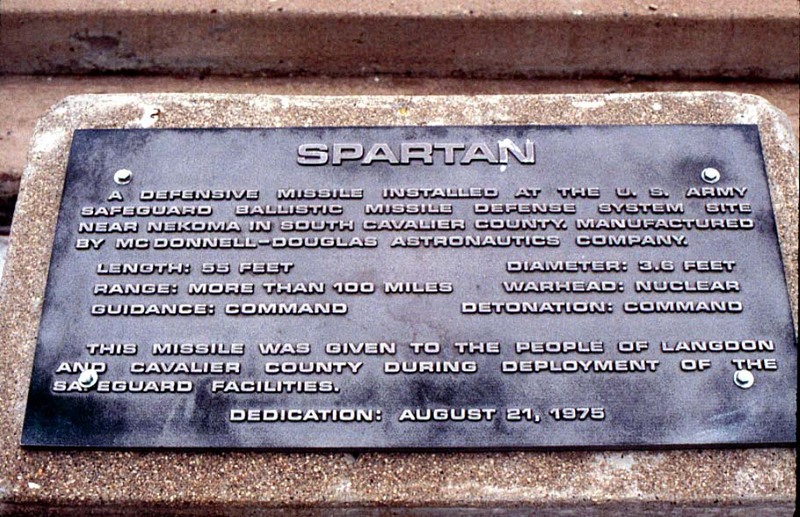 Spartan commemorative plaque in Langdon, N.D. Unfortunately in 2013 this all sounds similar. Then in Oregon we have the “slippery slimy” Senator Ron Wyden who tried to cast himself in a positive light. 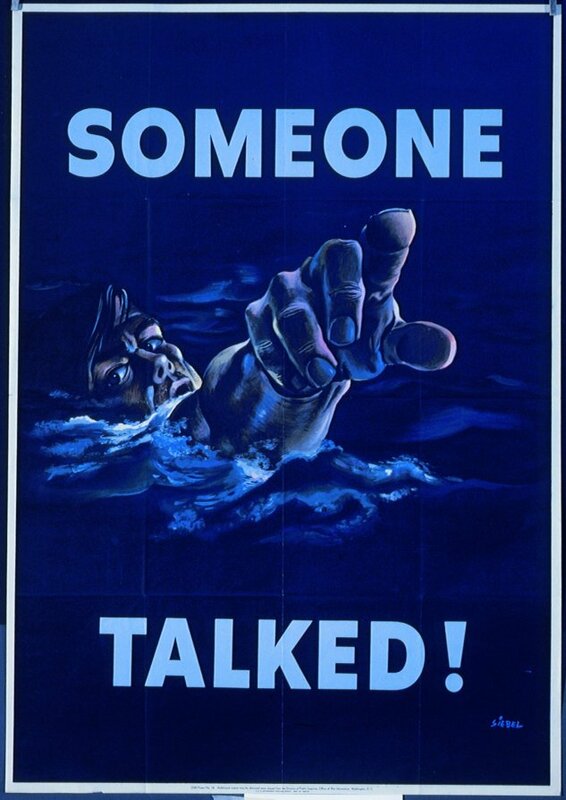 Being on the Intelligence Committee, he had been briefed and knew the answer, but ask the Director of National Intelligence, James Clapper, “do you collect telephone data on millions or hundreds of millions of Americans?” Mr. Clapper should have duck the question – neither confirm or deny here in open session – but instead he provided the least “untruthful answer” – or LIED. Hey, I want to defeat the terrorists as much as the next guy, but harvesting data on millions of innocent American’s… I don’t recall signing up for that or empowering a despotic government here in the U.S.
And long before PRISM there was Good Will Hunting. Why shouldn’t I join the NSA? It’s a classic! 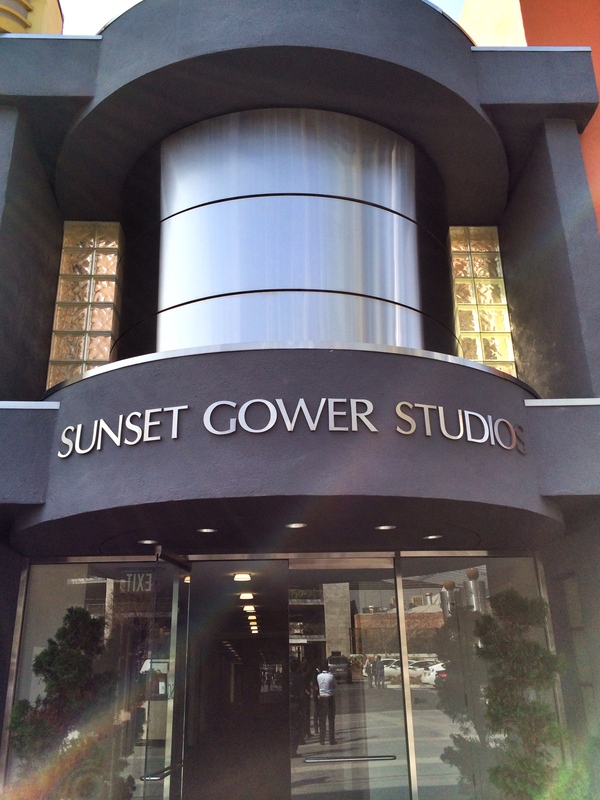 You might wonder where Christopher Boyce is now? In 1977 he was convicted of espionage and spent time in various federal prisons. In 1980, he made headlines when he escaped from Lompoc, CA., and remained on the run for 19 months while supporting himself by robbing banks in the Pacific Northwest. In 1997, he was released from the medium-security prison in Sheridan, OR., and sent to a halfway house in San Francisco. 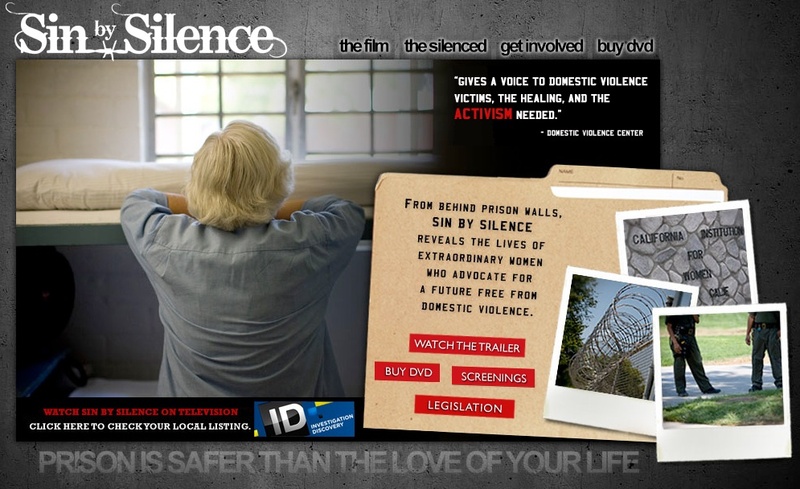 He married Cait Boyce, the woman who helped him fight for parole. In 2003 at the age of 50 years old, he was released from the halfway house. He remains free, but on parole until 2046, his original release date. Mr. Lee was paroled in 1998. 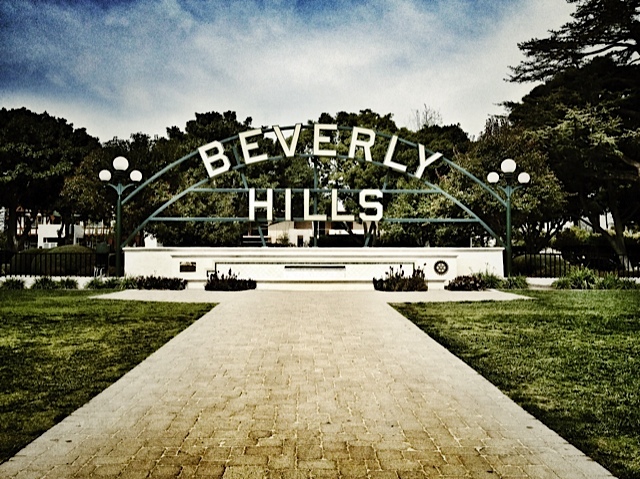 I was in L.A. last week driving down part of Route 66 towards the Santa Monica pier and through Beverly Hills enjoying the nice California weather. There were more yet-to-be licensed Benzes, Ferraris and Porsches over a three-mile stretch than I’ve seen in the past year. And here I was in an ultra-cool Nissan Cube rental, arm out the window and for a few blocks co-mingling with the rich and famous. Speaking of… did you read that the Harley-Davidson president and CEO, Keith Wandell, opted not to have his base salary increased in 2011, according to a proxy statement filed with the U.S. Securities and Exchange Commission. On the surface this – “we’re all in it together” – grand gesture would make a person believe that a CEO who accepts a ZERO increase in salary is saying they’re a team player who wants to make a sacrifice for the good of the company. After all wasn’t it Harley-Davidson management that laid-off hundreds of workers, closed plants and obtained impressive union concessions in a new multi-tiered workforce structure for the survival of the company? Call me cynical, but when I hear about these it seems more like “camouflage” to deflect scrutiny off the extraordinary set of CEO benefits or at minimum to get publicity and produce significant positive short-term market reaction. In fact, there are a number of reports which suggest these type of salary tactics are nothing but a ruse or smokescreen as a number of CEOs have adopted these pay schemes. It’s the kind of opportunistic behavior from those wealthier, more confident, influential CEO’s rather than sacrificial acts they are ‘projected’ out to be. I certainly don’t know if or what Mr. Wandell’s intent was, but we do know his total compensation in 2011 rose nearly 13% to about $7.2 million, compared with $6.4 million in 2010. We also know the motor company paid Mr. Wandell a bonus of $365,639 in 2011. He also received a base salary of $975,037 in 2011, equal to his salary in 2010. And to be clear this post isn’t about wealth envy or whining about how it must be nice to be rich. We all know that rich people and bankers are beating the system. They’re writing off multi-thousand dollar meals with rare wines at places with unlisted phone numbers that you/I can’t get into. Unless you just woke up in North Korea, then you know that in America, if you don’t like what you earn, where you work or what you do for a living then you’re entitled to leave (quit) and go start a company, further your education or do whatever the hell you want. It’s clear that company’s exist to make a profit for their shareholders and if the shareholders don’t like what the CEO is doing, or earning then they can fire the board of directors to include the CEO. But wait there’s even more. Mr. Wandell received total cash bonus payments, both discretionary and performance-based, totaling more than $2.8 million in 2011, compared with cash bonus payments of about $2.3 million in 2010. His stock awards were valued at $1.5 million, compared with $1.4 million in 2010, while his option awards were valued at $1.7 million, compared with $1.6 million the previous year. He also received “other” compensation totaling about $175,000 in 2011, compared with about $84,000 in 2010. The payments included $29,600 in lieu of receiving certain perquisites and personal benefits, nonqualified deferred compensation plan contributions of $68,466, 401(k) plan contributions of $31,850, and life insurance premiums of $13,727. He also received additional benefits that totaled $25,478 consisting of financial planning services, personal use of company aircraft and clothing. Well given that Mr. Wandell has made things happen, meaning that as “Head Honcho” he made moves that H-D insiders historically shied away from. He played hardball with dealers, shed crappy brands, cut labor contracts, made major job cuts and closed plants. Some folks were let go just prior to Christmas, but unfazed he continued to trim the fat and raised cash by selling some old investments, like Harley’s semi-secret test track in the Everglades. He also challenged Harley’s own traditional norms by altering its marketing strategy to attract non-traditional segments, like women and minorities. He also embarked on an international growth strategy that will eventually bring the all the products, the parts, the lifestyle, and the American V-Twin to enthusiasts worldwide. The financial numbers speak for themselves. All this from a guy who came to the Motor Company and did not even ride any kind of motorcycle! He’s earned a raise. 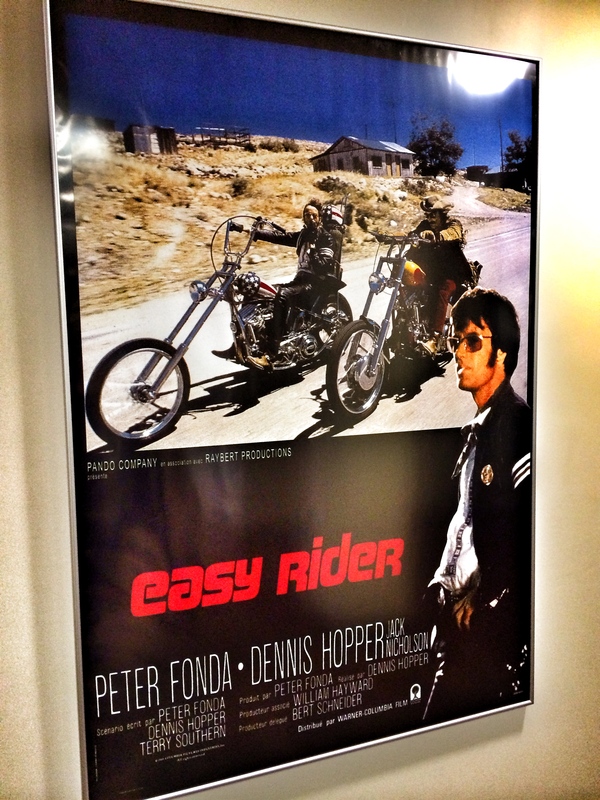 How hard is it to understand… Harley success = Industry success. Photo taken by author’s iPhone and post-processed in Snapseed (Nik Software). This is a sea change. It’s some of the highest quality and best video story telling I believe Harley-Davidson has ever created – bar none. Props to the marketing group and more importantly the agency, Campfire NYC, who are the creative storytelling folks behind this marketing experience. “The Ridebook” takes a look at the different people within the Harley culture. The first video (HERE) in the series is about the Tomcats Barbershop in Brooklyn, NY. Tomcats is co-owned by Joey Covington and Alex Melnichenko and has become the go-to place for motorcyclists to get 1950s-era haircuts. 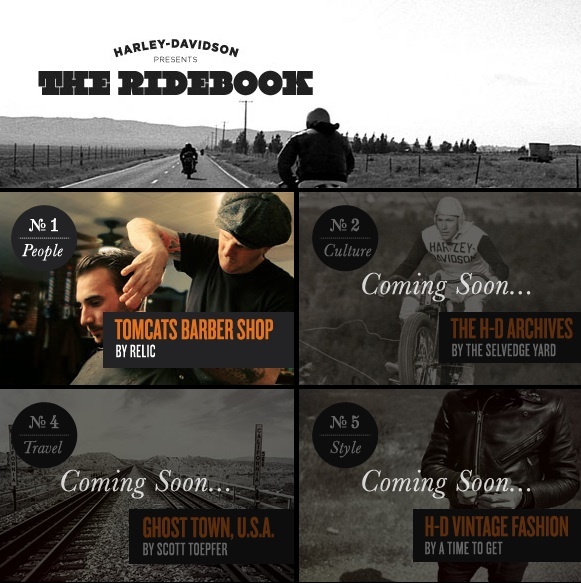 The next video in the “Ridebook” is called the HD Archive (By The Selvedge Yard), which will explore the Harley’s home in Milwaukee. Future videos include Bike Anatomy, Ghost Town U.S.A., H-D Vintage Fashion, and Open Air Playlist. Watch the videos and be enlightened! Dirt Road photo courtesy Hog Killers, Hawaiian Gardens, CA., Ridebook courtesy of H-D.